These meatballs are my family's absolute favorite meatballs and just so happen to be a great low carb recipe too! 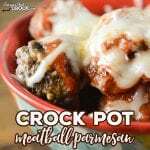 Crock Pot Meatball Parmesan creates tender meatballs full of flavor that are perfect over your favorite pasta substitute (or spaghetti if you aren't low carb). 1/2 Cup Marinara Sauce This is our favorite low carb sauce. In a large bowl mix together marinara sauce with meat, onion, garlic, parm, eggs and seasonings. I like to use my VERY favorite food chopper to mix up my meatball mixtures. Spray a 7 or 6 quart slow cooker with cooking spray and form mixture into 24 meatballs, stacking lightly if necessary. I like to use my large cookie scoop to form uniform meatballs. Remove meatballs from slow cooker. Set aside any you would like to freeze. To serve, toss in additional marinara and place over your favorite pasta/alternative and top with cheese. To freeze, place in a single layer on a cookie sheet and freeze for a couple hours then transfer to a freezer bag. Marinara sauces vary GREATLY in carb counts. This is our very favorite low carb pasta sauce with only 3 net carbs per 1/2 cup! We prefer this recipe with thin zoodles (Zucchini noodles). We find thinner zucchini noodles give a more pasta like feel than the thicker ones. I use the 2MM blade on our favorite spiralizer and they come out perfect every time! We figure this recipe (using the ingredients we used) to be approximately 1.2 net carbs per 3 meatballs. That does not include the additional marinara, zoodles or additional cheese to top your dish with as all those ingredients will vary greatly depending on how much you choose to use when serving.